Writing does not exist unless there is someone to read it, and each reader will take something different from a novel, from a chapter, from a line. After finishing Swimming Lessons, I’m a little sad I don’t have any more novels to read by Claire Fuller. I read Our Endless Numbered Days earlier this year and loved the fairy tale-like quality to the story, and Swimming Lessons evokes a similar response from me. 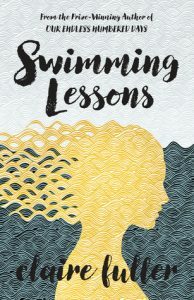 Swimming Lessons is about a woman named Ingrid who writes letters to her husband Gil. Instead of delivering the letters to him directly, Ingrid leaves the letters in topically relevant books that Gil has scattered all over his house. After leaving her final letter, Ingrid leaves and disappears from a beach in Dorset, leaving behind her husband and two daughters with unanswered questions. 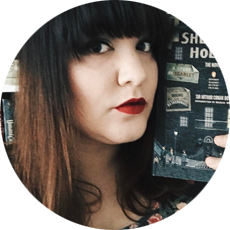 Twelve years after her disappearance, Gil – older and suffering from the effects of age – thinks he sees Ingrid in a bookshop and falls, hurting himself. Flora, his daughter, returns home to care for her father. Flora doesn’t believe that her mother died, only disappeared. While caring for her father, Flora begins to discover the answers to her questions about her mother’s life and disappearance in the books quite literally stacked all through her father’s home. I was hesitant to start this one because I wanted to read Our Endless Numbered Days first. I’m weird and sometimes like to read an author’s work in publication order. After completely devouring Fuller’s first novel in just a few days, I started reading this one almost immediately after. Fuller has a gift in transforming family tragedies and terrors into a story of mythical allure. I also have a soft spot for epistolary novels or books that incorporate letters and other forms of text communication, and Swimming Lessons does just that. I loved reading Ingrid’s thoughts throughout the years of her marriage, of her family, of herself, and seeing how the present day family reacts and responds to Ingrid’s letters. I’ve already talked about this book a lot to some of my customers at work and a few of my acquaintances, and I tell them, if you enjoy books about books and reading and letter writing with a family mystery tied into it all, you’ll really like this one. My favorite bits had to be the letters because Ingrid’s voice just felt so immediate and emotional. However, if you don’t like ambiguous endings, beware. You don’t get all of the questions answered, and you’ll be left thinking about the possibilities of hope and the reminders of grief once you’re through. I read it during some warm February days, and it’s the perfect kind of novel to read with the soft warmth of the day wafting through the windows. Thank you to Netgalley and Tin House Books for a review copy!